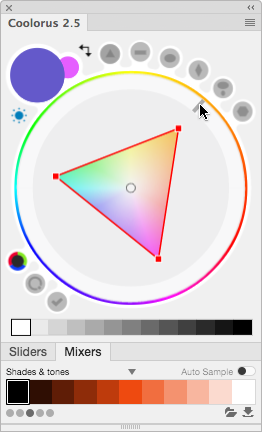 Coolorus is a color wheel plugin for Adobe® Photoshop®, inspired by Corel® Painter® color picker. Coolorus 2.5 is compatible with Adobe® Photoshop® CC 2014.2.2 and above on Windows and Mac. Coolorus 2.0 is compatible with Adobe® Photoshop® and Flash Professional® CS5 and CS6 on Windows and Mac. Your license is already compatible with Coolorus 2.0. Enjoy! Want to keep picked colors? Or share them with others? Or just blend them? It's all possible now with new Mixers panel. 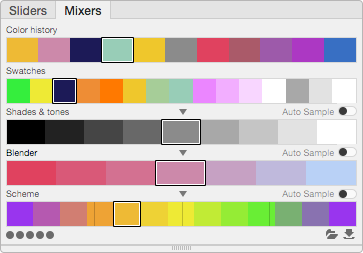 BrushBox - brush manager that helps you organize your brush and tool presets. Stop wasting time hunting for your favorite brushes! Hej Stylus! - is a control system for your graphic tablets pen, mouse or other input method for macOS. Lazy Nezumi Pro is a Windows plugin that adds pen stabilizers, rulers, scripting, and more to Photoshop and other art apps! Get and install the latest Coolorus version. At this moment there is no fix for Microsoft Surface and other tablet types. Dragging color markers while pressing button on Tablet Pen temporary fixes the issue. Hopefully Microsoft/Adobe will fix this soon. This happens when your displays have different pixel density. Please add CEPHtmlEngine as a new mapping application inside Wacom Preferences, it should have same settings that you have for Photoshop. ".exe" file can be found in this location:[Drive]:\Program Files\Adobe\Adobe Photoshop CC 20**\Required\CEP\CEPHtmlEngine\CEPHtmlEngine.exe Adding only one CEPHtmlEngine should fix all Photoshop versions. I'm getting 'Activations limit for this license reached' error, why? Each license key can be used to activate Coolorus on up to two machines. To activate it on another one you have to deactivate it on the previous one. If that's impossible use 'Manage your licenses' option from the bottom of this page and follow the instructions. Extension Manager is not available for CC, you can read more about it here: HERE. Use Coolorus installer instead to install Coolorus for both CS and CC Photoshop versions. This issue usually occurs when there is firewall enabled or any other app that prevents processed to connect to internet, to fix this firewall should allow connections from CEPHtmlEngine process or be disabled temporarly. Go to Photoshop Preferences and under Plug-ins check if options like "Allow Extensions Connect to internet" and "Load Extension Panels" are enabled. If changes are required Photoshop should be restarted as well. What do I get purchasing a license? Each license key can be used to activate Coolorus on up to two computers (for your personal/commercial use). All updates withing the same major version will be available for free. In order to make pen pressure back again user should open Wacom Driver Preferences and disable "Windows Ink" option under Pen ➜ Mapping. Then restart Photoshop. I'm getting 'This is trial version of Coolorus. Either your settings do not allow plugins to access internet or our servers are temporarily unavailable' error, why? Make sure you have an internet connection, and have this option: 'Edit -> Preferences -> Plugins -> Allow Extensions to Connect to the Internet' checked. Will Coolorus support Retina Displays? Coolorus supports Retina Displays from the beginning. Unfortunately Adobe untill version CC hasn't support Retina flash panels, so can't have Retina Coolorus on CS6 and earlier. That's not the case for Mac version of Coolorus. Use 'Manage your licenses' option from the bottom of this page and use "Retrieve License Key" form. Where I can get Coolorus 1.x? Report bugs or new features. If you do find a bug, annoying behavior or you simply have an idea on how to improve Coolorus, drop us e-mail. We will reply as fast as we can. We've just send you e-mail with link to retrieve your license. We couldn't find your serial number. We couldn't find your email address. Ups, something went wrong. Try again. To reset activations limit enter your e-mail address, license key and press "Deactivate". Done! Now you can activate Coolorus again using this license! We couldn't find your license. Ups, something went wrong. Please try again. New license should be on your mailbox now. This copy of Coolorus v 2.x ("the Software Product") and accompanying documentation is licensed and not sold. This Software Product is protected by copyright laws and treaties, as well as laws and treaties related to other forms of intellectual property. Moon Gorilla Ltd. or its subsidiaries, affiliates, and suppliers (collectively "Moon Gorilla") own intellectual property rights in the Software Product. The Licensee's ("you" or "your") license to download, use, copy, or change the Software Product is subject to these rights and to all the terms and conditions of this End User License Agreement ("Agreement"). AcceptanceYOU ACCEPT AND AGREE TO BE BOUND BY THE TERMS OF THIS AGREEMENT BY DOWNLOADING THE SOFTWARE PRODUCT OR BY INSTALLING, USING, OR COPYING THE SOFTWARE PRODUCT. YOU MUST AGREE TO ALL OF THE TERMS OF THIS AGREEMENT BEFORE YOU WILL BE ALLOWED TO DOWNLOAD THE SOFTWARE PRODUCT. IF YOU DO NOT AGREE TO ALL OF THE TERMS OF THIS AGREEMENT, YOU MUST NOT INSTALL, USE, OR COPY THE SOFTWARE PRODUCT. License GrantThis Agreement entitles you to install and use two copies of the Software Product. In addition, you may make one archival copy of the Software Product. The archival copy must be on a storage medium other than a hard drive. This Agreement does not permit the installation or use of multiple copies of the Software Product, or the installation of the Software Product on more than two computer at any given time, on a system that allows shared used of applications, on a multi-user network, or on any configuration or system of computers that allows multiple users. Multiple copy use or installation is only allowed if you obtain an appropriate licensing agreement for each user and each copy of the Software Product. Restrictions on TransferWithout first obtaining the express written consent of Moon Gorilla, you may not assign your rights and obligations under this Agreement, or redistribute, encumber, sell, rent, lease, sublicense, or otherwise transfer your rights to the Software Product. Restrictions on UseYou may not use, copy, or install the Software Product on any system with more than two computers, or permit the use, copying, or installation of the Software Product by more than one user or on more than two computer. If you hold multiple, validly licensed copies, you may not use, copy, or install the Software Product on any system with more than the number of computers permitted by license, or permit the use, copying, or installation by more users, or on more computers than the number permitted by license. Restrictions on AlterationYou may not modify the Software Product or create any derivative work of the Software Product or its accompanying documentation. Derivative works include but are not limited to translations. You may not alter any files or libraries in any portion of the Software Product. You may not reproduce the database portion or create any tables or reports relating to the database portion. Restrictions on CopyingYou may not copy any part of the Software Product except to the extent that licensed use inherently demands the creation of a temporary copy stored in computer memory and not permanently affixed on storage medium. You may make one archival copy which must be stored on a medium other than a computer hard drive. Limited Software Product WarrantyFor a period of 30 days from the date of shipment or from the date that you download the Software Product, as applicable, Moon Gorilla warrants that when properly installed and used under normal conditions, the Software Product will perform substantially as advertised. Disclaimer of Warranties and Limitation of LiabilityUNLESS OTHERWISE EXPLICITLY AGREED TO IN WRITING BY MOON GORILLA, MOON GORILLA MAKES NO OTHER WARRANTIES, EXPRESS OR IMPLIED, IN FACT OR IN LAW, INCLUDING, BUT NOT LIMITED TO, ANY IMPLIED WARRANTIES OF MERCHANTABILITY OR FITNESS FOR A PARTICULAR PURPOSE OTHER THAN AS SET FORTH IN THIS AGREEMENT OR IN THE LIMITED WARRANTY DOCUMENTS PROVIDED WITH THE SOFTWARE PRODUCT. Moon Gorilla makes no warranty that the Software Product will meet your requirements or operate under your specific conditions of use. Moon Gorilla makes no warranty that operation of the Software Product will be secure, error free, or free from interruption. YOU MUST DETERMINE WHETHER THE SOFTWARE PRODUCT SUFFICIENTLY MEETS YOUR REQUIREMENTS FOR SECURITY AND UNINTERRUPTABILITY. YOU BEAR SOLE RESPONSIBILITY AND ALL LIABILITY FOR ANY LOSS INCURRED DUE TO FAILURE OF THE SOFTWARE PRODUCT TO MEET YOUR REQUIREMENTS. MOON GORILLA WILL NOT, UNDER ANY CIRCUMSTANCES, BE RESPONSIBLE OR LIABLE FOR THE LOSS OF DATA ON ANY COMPUTER OR INFORMATION STORAGE DEVICE. UNDER NO CIRCUMSTANCES SHALL MOON GORILLA, ITS DIRECTORS, OFFICERS, EMPLOYEES OR AGENTS BE LIABLE TO YOU OR ANY OTHER PARTY FOR INDIRECT, CONSEQUENTIAL, SPECIAL, INCIDENTAL, PUNITIVE, OR EXEMPLARY DAMAGES OF ANY KIND (INCLUDING LOST REVENUES OR PROFITS OR LOSS OF BUSINESS) RESULTING FROM THIS AGREEMENT, OR FROM THE FURNISHING, PERFORMANCE, INSTALLATION, OR USE OF THE SOFTWARE PRODUCT, WHETHER DUE TO A BREACH OF CONTRACT, BREACH OF WARRANTY, OR THE NEGLIGENCE OF MOON GORILLA OR ANY OTHER PARTY, EVEN IF MOON GORILLA IS ADVISED BEFOREHAND OF THE POSSIBILITY OF SUCH DAMAGES. TO THE EXTENT THAT THE APPLICABLE JURISDICTION LIMITS MOON GORILLA'S ABILITY TO DISCLAIM ANY IMPLIED WARRANTIES, THIS DISCLAIMER SHALL BE EFFECTIVE TO THE MAXIMUM EXTENT PERMITTED. Limitation of Remedies and DamagesYour remedy for a breach of this Agreement or of any warranty included in this Agreement is the correction or replacement of the Software Product. Selection of whether to correct or replace shall be solely at the discretion of Moon Gorilla. Moon Gorilla reserves the right to substitute a functionally equivalent copy of the Software Product as a replacement. If Moon Gorilla is unable to provide a replacement or substitute Software Product or corrections to the Software Product, your sole alternate remedy shall be a refund of the purchase price for the Software Product exclusive of any costs for shipping and handling. Any claim must be made within the applicable warranty period. All warranties cover only defects arising under normal use and do not include malfunctions or failure resulting from misuse, abuse, neglect, alteration, problems with electrical power, acts of nature, unusual temperatures or humidity, improper installation, or damage determined by Moon Gorilla to have been caused by you. All limited warranties on the Software Product are granted only to you and are non-transferable. You agree to indemnify and hold Moon Gorilla harmless from all claims, judgments, liabilities, expenses, or costs arising from your breach of this Agreement and/or acts or omissions. Governing Law, Jurisdiction and Costs This Agreement shall be governed by the laws of Poland and you hereby submit to the exclusive jurisdiction of the Polish courts. Our order process is conducted by our online reseller Paddle.com. Paddle.com is the Merchant of Record for all our orders. Paddle provides all customer service inquiries and handles returns.Adobe, the Adobe logo, and Photoshop/Flash are either registered trademarks or trademarks of Adobe Systems Incorporated in the United States and/or other countries. Apple, the Apple graphics are trademarks of Apple Inc., registered in the U.S. and other countries. Corel Painter is a registered trademark of Corel Corporation or Corel Corporation Limited.